Chester Creek in Chanshtnu Muldoon Park, east of Muldoon Road at DeBarr. – CHANSH-nu – meaning Grass Creek. Coho salmon spawn in the creek. CLICK HERE for a map of Chester Creek in Chanshtnu Muldoon Park in a new browser tab. 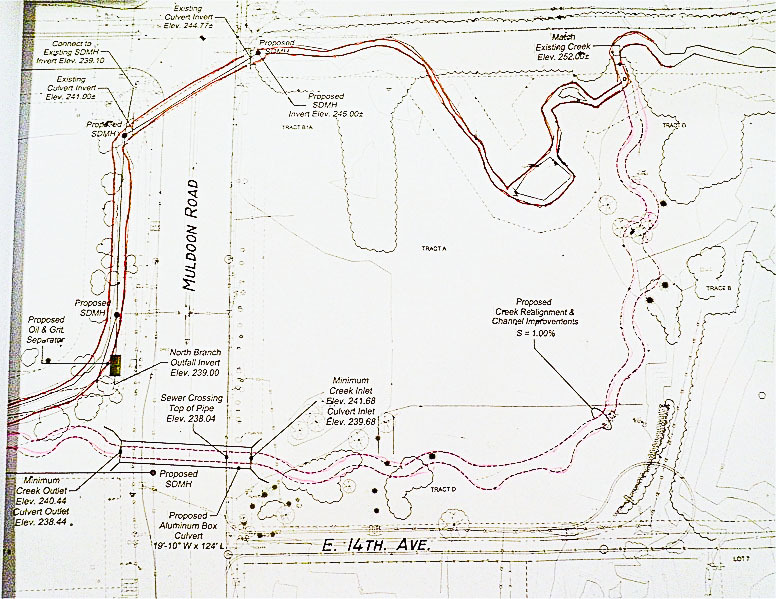 The top route (red solid line) on the map is the historic position – Chester Creek’s original, natural streambed. The bottom route (pink dotted line) is where the Municipality chose to move it. Click on any photo to see an enlargement. (Tap on devices – Smart Phones, Tablets, etc.) Click (or tap) on any enlargement to see the next one. Or navigate by clicking on left and right arrows for previous or next photo. …mirroring the sky in a timeless and peaceful setting. …a little water flows through the logs placed there by the industrious beavers. …rippling along at a good pace through spring’s leafy greenery. …and emerges from the forest just before it runs under Muldoon Road. KSKA Public Radio story June 20, 2012: Despite Community Outcry, Anchorage Assembly Moves Ahead with Chester Creek Realignment. The Anchorage Municipal Assembly held a new public hearing,, at which many east Anchorage residents turned out to testify. Resolution No. AR 2011-340(S amended) was passed, 6-5. It included numerous stipulations and restraints regarding realignment of the creek. It reflected East Anchorage residents’ interest in development of the old Alaska Greenhouse property as a community park. Northeast Community Council and Scenic Foothills Community Council passed multiple resolutions in favor of dedicating municipal property along Chester Creek southeast of Muldoon Road and DeBarr Road intersection for a park. The planned realignment, as currently mapped, was geared for commercial development and does not appear to be a good fit with the proposed Muldoon Town Square Park. Alaska Dispatch News: Dingman: Muldoon needs a park, not another strip mall – September 23, 2014, opinion piece. Alaska Dispatch News: Anchorage Mayor vetoes Muldoon Road parkland designation – March 17, 2014, news story. Anchorage Daily News: Plan for Muldoon park advances in Assembly on 6-5 vote – March 1, 2012, news story. Anchorage Daily News: Muldoon Road park sought by residents – February 27, 2012, news story.